Caring is a complex and fundamental human relational assumption around which all institutional and personal educational interactions are planned. As an ethic, the basis of academic and personal bonds, and the mark of an authentic community, it stands behind what academics and teachers do as the core of their work and consequently appears in missions, visions and values statements for colleges and universities worldwide. Yet, in the admittedly scarce research in the area, there seems to be a profound mismatch between what learners and teachers feel and expect about caring, and what institutions operationalize in their attempts to somehow capture and cultivate care. The research that does exist seems either to take an inherently practical approach to using caring pedagogy as a remedial solution to all kinds of student and institutional problems, or it views caring as a progressive pedagogical project, that presents an existential risk to staff and students alike. In the existing studies, learners articulate care as a positive and wholly enjoyable part of learning, not grounded in transactional processes or measured outcomes. Likewise, academics frequently want to care, and indeed, see little distinction between emotion and cognition, as Vygotsky himself pointed out of course. Indeed, caring pedagogy isn’t so progressive at all. It may well be risky, but in a rigorously scholarly exposing sense, rather than an emotional and well-being sense. 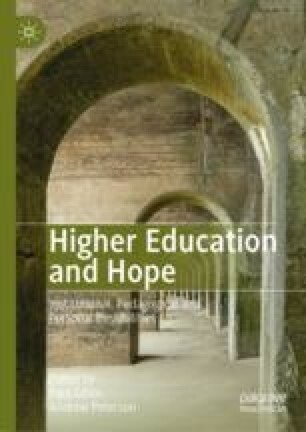 This chapter examines why there appears to be so little disruption of the higher education pedagogy as recounted in literature, examines the possible impact on students’ learning in relation to a reconceptualization of relationships, and asks what direction should we take to properly understand the relational and cognition satisfaction, not to say joy, of caring? And how then, is it possible to properly care within a risky higher education context, whilst still holding out for hope? The implications for this discussion on higher education academic practice are therefore critical at this time of change in the levels of accountability and in the discursive construction of ‘learning gains’ within higher education.